"...the disc is an exceptionally engaging Weiss recording... what wonderful expressiveness and musical intelligence David Miller brings to this music. One feels that he has played phrase after phrase just right—with exactly the right rubato, and dynamic phrasing. " a"Miller's playing is mature, self-assured and well-balanced ... I think it is a worthwhile addition that soon will belong to your favourite Weiss CDs. Both [lutes] sound wonderfully full, round and warm." "...enthralling CD...David Miller plays with a particular sensitivity to musical ebb and flow, as well as producing a beautifully rich and refined tone. Andrew Benson-Wilson, Early Music Review. Silvius Leopold Weiss was undoubtedly one of the most highly revered performers of his generation and by far the most prolific composer for the lute, with some 600 solo pieces to his name. An almost exact contemporary of J S Bach, he was known in his lifetime as ‘the famous Weiss’. A ten minute film made during the recording of the album. David Miller discusses Weiss and his music on location at the church of St Mary Our Lady, Sidlesham. 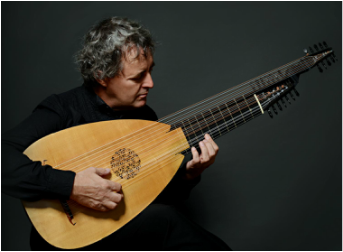 David Miller is a long established soloist and well known as an accompanist and continuo player on lute, theorbo and early guitars, flourishing in both the early music world and the mainstream musical scene. He performs and records with all the principal English period instrument orchestras and with many of the finest ensembles, appearing at numerous prestigious European music festivals. Elin Manahan Thomas and Stephen Varcoe, harpist Frances Kelly, violinists Elizabeth Wallfisch and Rachel Podger, fellow lutenist Jacob Heringman, and Arab singer and oud player Abdul Salam Kheir. I fail to recall an audience so entranced and focused on listening to music"
"He is excellent both as a partner to the voice and as a soloist."